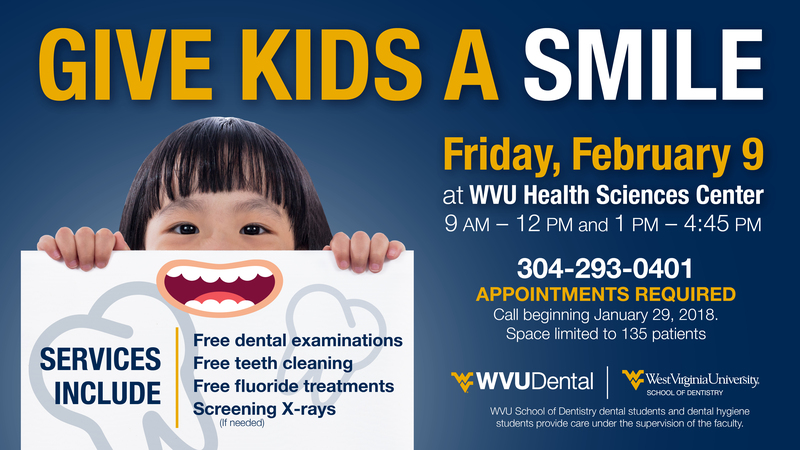 MORGANTOWN, W.Va. – WVU Dental Care will celebrate National Children’s Dental Health Month by offering free examinations, screening X-rays if needed, and fluoride treatments to children ages one to 17 from 9 a.m. to 4:45 p.m. on Friday, Feb. 9 in the WVU Pediatric Dentistry Clinic. The appointments are part of the annual “Give Kids a Smile!” national dental access program of the American Dental Association and the West Virginia Dental Association. Dental and dental hygiene students from the WVU School of Dentistry will perform the care under the supervision of the faculty. Appointments are required, and space is limited. To schedule an appointment for the free exam, call 304-293-0401. Patients can begin calling to request appointments Jan. 29. “It’s something we look forward to every year. WVU Pediatric Dentistry believes in prevention and education. This is a way we can provide an opportunity for our children and parents to participate in this national event. This is part of our outreach program for National Children’s Dental month,” Therese Bonasso, dental hygienist, said. The free exams provide more than $100 worth of services for children.